I have known Ron Sturgeon for around 20 years or so and worked for him About 10 years. The other day he asked me to pick out my favorite toy in the museum. In a word, “Impossible.” I have a passion for antique toys. I collect, buy and sell them from my home as a hobby. Thanks to Ron, I took to it like a duck to water. That being said, how could I pick a favorite? It can’t be done. There are just too many. I suppose if Ron had asked me to pick one of the most expensive that would have been a little easier, but it still would have been a monumental task since there are several toys that may go as high as $25,000 plus. 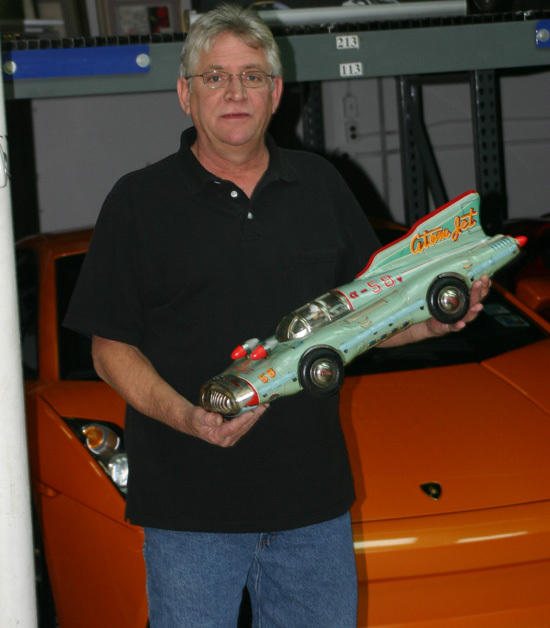 I walked into Ron’s office, surrounded by some of the finest antique toys known to man, and picked an Atom Jet Racer out of one of the cases. This fabulous tin lithograph toy is 27-inches long and features a friction motor and tin driver. It was made in Japan in the 1950s by Yonezawa, a famous Japanese toy maker. This toy has a scarcity rating of 10 – (very rare) This one is in excellent condition and would fetch easily around $3,500 or more at auction. Thankfully I doubt it will see an auction house for many years to come. But as far as my favorite? This one will do for today.